There has continuously been a continual flow of career opportunities for professionals of engineering in Australia. It not only limited to a specific discipline but all engineering occupations which are primary. As per the Hays, Engineering Recruiting Experts, there will be a heavy need of Structural Engineers, Civil Drafters, Intermediate Civil Engineers, 12D Designers, Civil Design Engineers, Electrical Engineers, Revit Drafters, Traffic Modellers, Water Engineers, Transport Planners, Fire Design Engineers, Hydraulic Drafters and Civil Design Engineers in the coming months of 2018. Following the constant market, the Australian government has taken several actions to fill the deficit of specialized and skilled professionals. One such effort is beginning the Skilled Recognised Graduate Visa. All the international students of engineering who get degree or qualification from universities in Australia will be recognized qualified to work in Australia not having any experience if they continue a Skilled Recognised Graduate 476 Visa. If you are presently seeking an degree of engineering in Australia or have newly become graduate, probabilities are you would also like to take this pathway to get good job prospects in Australia and improve career growth. Hence, to guarantee you know all the required criteria for Skilled Recognised Graduate 476 visa and to assist you to make an informed choice, we have brief information about this 476 visa. 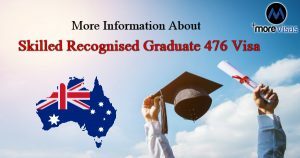 Skilled Recognised Graduate 476 Visa is a short-term visa for current international graduates of engineering that permits them to obtain employment and gain specialized Australian work experience. Validity of this visa is up to 18 months. • Educational Qualification: Bachelors, masters, doctoral or postgraduate diploma in engineering. Specialization in either civil, chemical, environmental, structural, mechanical, production & plant, electrical & electronics, mining and material engineering. • You need to apply for the visa within 24 months of finishing an eligible engineering qualification from Australian recognized institution. • Never hold a temporary graduate 485 visa or skilled recognized graduate visa (unless you were dependent on visa). • Meet the necessary English language skills. • Meet the requirements of health and character. There are many tests available that aid you provide proof of your language ability in English for lodging a visa. These include IELTS Academic, PTE (Academic), OET, TOEFL, and Cambridge (CAE). The Processing time 476 visa application is 3 to 4 months. The processing fee is AUD 365. Note: The processing time and fees may change due to individual factors. You need to provide a police clearance certificate from each nation you’ve lived for more than one year in the past 10 years after you turned your age to 16 years. These certificates need to prove you have no criminal records. 476 visa is only valid for the tenure of 18 months only and cannot be continued. Other pathways can help you continue your stay and get Australian permanent residency in the Australian country.